As microprocessors and other electronic components in servers grow more powerful, they consume more electrical power. Consequently, they emit more heat. The primary cause reported of electronic device failures is overheating. All microprocessors have a maximum allowable temperature above which the processor will fail. Servers also contain many other electronic and electromechanical components that are susceptible to heat-induced failure. In general, electronic components that operate at lower temperatures will experience fewer failures, operate faster and last longer. 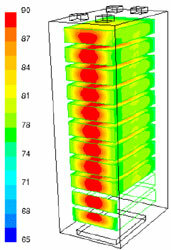 While many computer rooms have sufficient cooling capacity, inefficiencies in the airflow within electronic enclosures have led to overheating, resulting in server shutdowns. 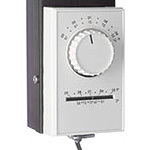 Some operators have compensated by lowering the overall computer room temperature, but this solution leads to overly cool computer rooms, and is at best a short-term fix. The projected continued growth in microprocessor capacity will require more efficient use of cooling resources, especially for rack-mounted servers in electronic enclosures. Ventit Trays. 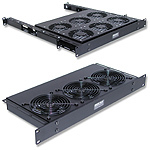 Fan trays for accelerated air-flow throughout a server/equipment cabinet. Ventit Controller for controlled operation of cooling devices based on internal cabinet temperature.